1. Which of these is not the name of a fighting robot in the movie? Black Lightning was a bull. 2. What is the questionable choice of 'breakfast' that Charlie consumes before he shows Ambush to some kids? 3. Charlie takes issue with Ricky's arranged fight with a 2,000lb bull named Black Lightning. Why? 4. Ricky, the entrepreneurial promoter, tells the rural Texas crowd that he brought a fighting robot to their small town because they "shouldn't have to drive all the way to _____." 5. Thanks to Charlie being distracted by a pretty blonde in the crowd, Ambush is...well...ambushed by the bull. What limb does he lose first? 6. How much does Charlie essentially sell his custodial rights to max for to the boy's aunt and uncle? 7. What is the name of the robot that Charlie buys for $45k that was once a contender but most recently was in Brazil? 8. The deal that Charlie strikes with his uncle is that he keeps Max through the summer while his aunt and uncle are where? 9. Initially Noisy boy's voice recognition only responds to what language? 10. According to Max, he learned Japanese how? 11. Max threatens Charlie with what to convince him to take him to the fights with him? 12. While Charlie loads Noisy Boy's remains into the truck, he leaves behind what (which he sold for $400)? 13. What best describes Charlie's own boxing career? He had a winning record. He never actually fought because he was a trainer. According to Bailey, "Twenty four and nineteen! But every fight a knock out." 14. At the junkyard, a broken Atom is the reason Max doesn't slide off a cliff. What generation of robot is Atom? 15. According to Bailey's father, who trained Charlie: "Fight’s not over ‘til someone is ____." 16. What fast food staple does Max hate, which Charlie foolishly tries to give him more than once? 17. Atom's opponent at the zoo, Metro, has what weapon in place of one of his hands? 18. 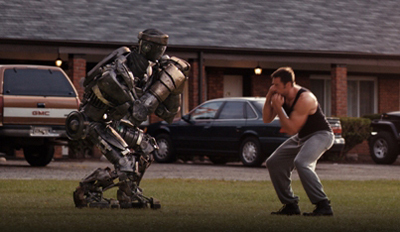 In their first official league fight, Atom's opponent is who? 19. Before their fight against Twin Cities, Zeus' owner offers Charlie and Max ______ to buy Atom. 20. After Atom takes a series of beatings from Twin Cities in the corner, Charlie sees what part of Twin Cities is his weakness? 21. As Charlie turns over Max to his aunt and uncle, the boy tells Charlie: "I wanted __________. That’s all I ever wanted." 22. In the title bout, Atom is the first opponent to successfully land a punch on Zeus. What punch was it? 23. How many rounds does Atom last against Zeus? 24. How does the title fight end? 25. Despite the decision loss and based upon the rousing crowd reaction, the announcer proclaims Atom as: "___________."